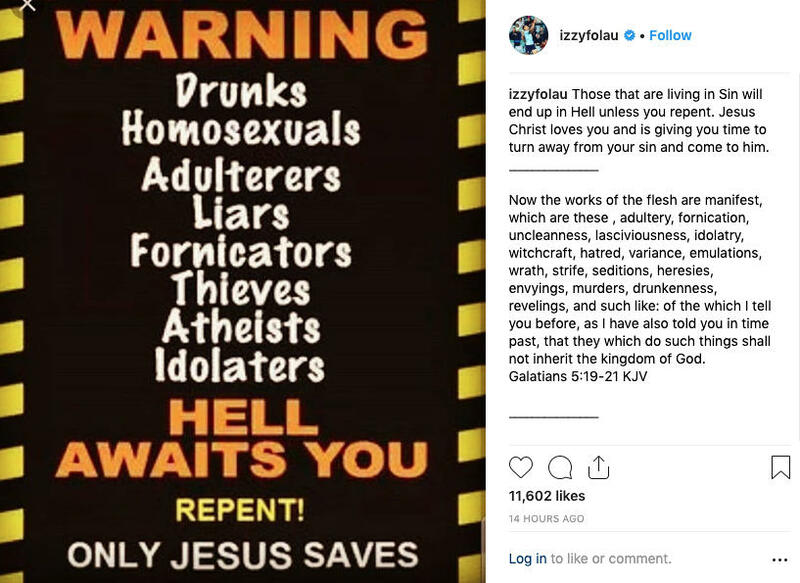 Israel Folau’s latest social media post condemning gay people to hell and damnation has no place in rugby union. His views have no place in society at all. How that still escapes him is beyond me. People can no more choose their sexuality than they can the colour of their skin. It is not a heinous crime for which someone must repent, simply part of who they are. Yet by saying gay people are hellbound purports the notion they are lesser than everyone else. That there’s something wrong with them. That they need to change. The consequences of such backwards views can be catastrophic. The statistics tell us gay men have higher rates of depression, suicidal thoughts and suicide attempts than the rest of the population. The stories are even more sobering. Take this first-hand account of a 13-year-old schoolmate who committed suicide which Harry Jones was good enough to pen for The Roar last year. “When I read Israel Folau’s remarks, forty years on, I felt sick again. Not about him having pious beliefs, drawn from an ancient text. He seems sincere. He has a great smile and is trying to be a good man. Folau’s comments are as helpful to the LGBTQI community as a can of kerosene and a match are to a book. Those words matter, particularly coming from someone with such a profile. They contribute to a troubling societal issue. After finding himself in hot water for two similar posts last year, surely he doesn’t not know how inappropriate his comments are. Ignorance is about as believable an excuse as ten-year-olds claiming the dog ate their homework. And let’s not turn this into a freedom of speech issue. Freedom of speech means Folau can say what he wants. It doesn’t make him immune to the consequences of doing just that. So now we’re left with a multitude of questions. Why did Folau publish that post? What did he think he’d achieve? Will Rugby Australia’s sponsors threaten, once again, to walk? Above all, what happens now to Folau? He’s just started a new four-year deal with Rugby AU. He’s one of the most in-form Wallabies heading into the World Cup, having just broken Super Rugby’s all-time tryscoring record. And he reportedly has a clause or two in his contract designed to prevent him from posting exactly this kind of content. 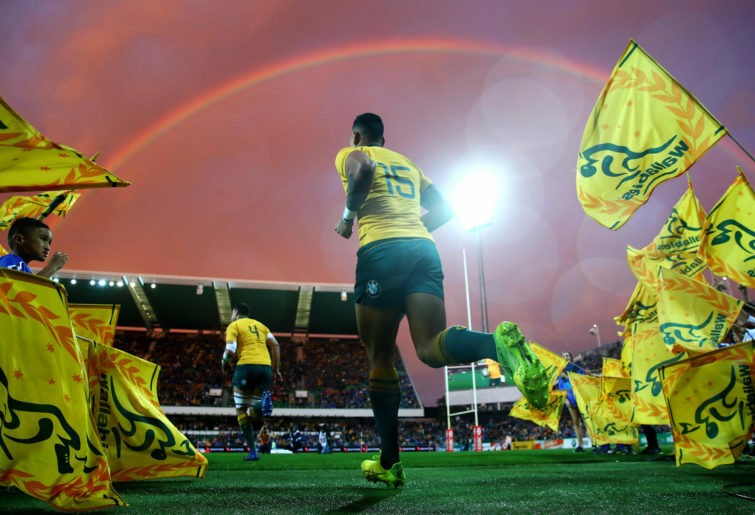 If that clause does exist, if Rugby AU seriously care about the LGBTQI community in Australia – a community which undoubtedly contributes to rugby’s player base – they should show Folau the door. The governing body’s response last night – branding it unacceptable and disrespectful – was a far cry from last year, when they tried to tiptoe their way through the issue while trying to keep everyone onside. It hints that a proper reprimand may be on the way. One can only hope that’s the case. Folau said in the past he was prepared to walk away from rugby “if the situation became untenable”. Having now made it clear on three occasions that he’s going to promote beliefs which have no place in rugby union (or modern society, for that matter), it’s time to take him up on that offer. What’s the saying? Third time pays for all? Booting Folau from the game would be a severe measure, but not an unwarranted one. It would deprive the Wallabies of one of their most gifted players at the World Cup, but there are some more than serviceable alternatives to Folau – Dane Haylett-Petty, Tom Banks and Reece Hodge are but a few. Even if there weren’t, it doesn’t matter. Some things are more important than winning rugby matches. Having a superstar player spout homophobic nonsense while representing the sport is one of them.